Introducing the Beaconstac app – Watch Beacons in Action! Although the whole world is excited to see, learn and understand beacons, very few have actually seen a beacon and an app work together. 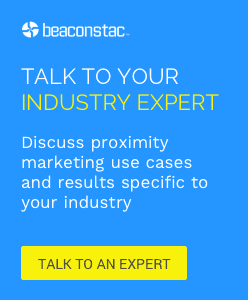 We got a lot of questions about how beacons work in a real-world scenario and how the Beaconstac platform can be used to trigger proximity messages. So, we built our Beaconstac app and made it available for free on the App Store. If you wish to experience a proximity marketing campaign first-hand, before investing your time and money in a beacon pilot project, this app is just right for you! The app emulates a retail store and is built using Beaconstac, a software platform for proximity marketing and analytics using beacons. 1. Detect and add beacons – The app detects nearby beacons automatically and provides a list of beacons present within the app’s range. You may add those detected beacons or add beacons manually. 2. Create and assign offers for each beacon – Once beacons are added, assign appropriate rules for each beacon. Consider each beacon to be a department in a retail store – say, music, sunglasses and shoes, and add appropriate offers that need to be triggered when a user visits that particular department (a particular beacon) in the store. 3. Proximity-based offers – As a user walks closer to a particular beacon, see a contextual offer pop up on their phone. The Beaconstac app enables you to see beacons in action and shows how a beacon app works. Watch in awe as the campaign unfolds in front of you, as you walk around the beacons. I am sure you will find it cool and get inspired too! Check out the Beaconstac app now, and let us know how you like it.